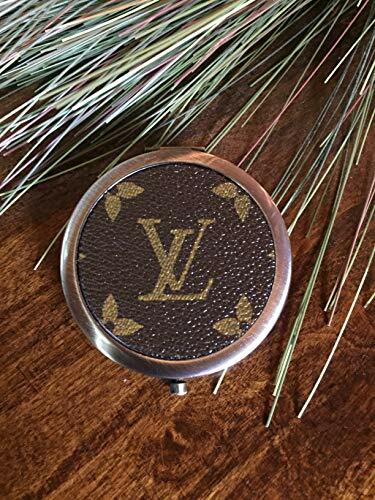 Handcrafted compact mirror fashioned with authentic repurposed Louis Vuitton canvas. This beautifully handcrafted antique brass makeup mirror is the perfect addition to your LV collection. measures 2 3/4in. X 3/8in. DISCLAIMER: This item is handcrafted by me utilizing canvas from upcycled and repurposed authentic LV bags. This item is NOT manufactured, licensed or sold by Louis Vuitton. We are in NO way associated or affiliated with Louis Vuitton or its subsidiaries. If you have any questions about this product by FobulousFinds, contact us by completing and submitting the form below. If you are looking for a specif part number, please include it with your message.